"It didn't go so well. Oliver is tiny. A small piece with no notion of where he fits, Oliver sets out to find his place in the puzzle world. He has big plans. He knows that he would like to fit in somewhere, and he's willing to take the time it takes to find his ideal spot. Unfortunately, while he can see others who sport the same colors, he cannot find anywhere that needs a blue, orange and purple round-headed piece. It's hard to take! 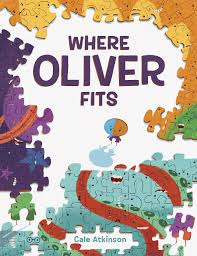 The other puzzle pieces are disparaging, and argue that he will never find that place. It makes him sad enough to try and alter the way he looks. No matter what he tries, he fails to find acceptance. Finally, he restructures himself and paints himself purple. That should do it! "Oh, hello there!" the other pieces greeted him. "Where were you hiding? Where have you been?" Finally, he finds a fitting spot. But, no one really knows who he is. It doesn't sit well with him. Removing his disguise has dire consequences. It doesn't take long for him to find others in the same predicament ... they don't fit anywhere. Might they find a place together? The attractive colors and heartfelt scenes created 'with puzzle pieces, glue, space unicorns and Photoshop' are a perfect fit for the story. Readers will be intrigued to see how they match up, and to read the many speech bubbles that show emotion throughout the telling. 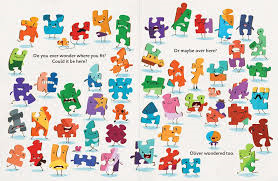 Be sure to have some puzzles nearby when you finish reading it to your kids, or your class. It might prove just the right time to try their hand at puzzle building skills.